The study, conducted by clinical psychologist Robin Rosenberg and colleagues from Stanford University’s Virtual Human Interaction Lab, not only reinforced common superhero tropes, but also showed how using virtual reality experiences can increase pro-social behavior in the physical world, an area researchers say holds vast potential. “It’s a technology that can be used for good or ill and I’d love to see it used for good,” Rosenberg told Discovery News. She’s written extensively on the psychology of superheroes in such books as What’s The Matter With Batman? and the recently published Superhero Origins. Jeremy Bailenson, associate professor of communication at Stanford University and founder of the Virtual Human Interaction Lab, says for years he and his colleagues have run virtual reality experiments with a the following assumption always taken as a given: experiences in VR are profound. For the study, 30 female participants and 30 male participants were immersed in a foggy virtual reality city and given the power of flight — like Superman — or the experience of riding as a passenger in a helicopter. Those groups were then assigned one of two tasks: help find a missing diabetic child in desperate need of an insulin injection or leisurely tour their virtual environment. Therefore, the study was a two-by-two design, with participants assigned to one of four groups. See a video here. After their VR experience, participants were taken out of their head-mounted-display masks and asked to have a seat. While the experimenter fumbled with the VR equipment, she “accidentally” knocked over a cup of 15 pens sitting on a table near the participant’s chair. Researchers found that participants who experienced the power of flight in virtual reality were not only quicker to help pick up the pens than their helicopter-riding counterparts, they also picked up more pens. Of the six participants that didn’t help, all were in the helicopter condition. The task of ‘helping the diabetic child’ showed no main effect; only the superpower of flight did. But why? Wouldn’t the task of rescuing a lost child spring a superhero into more helpful action? “The hypothesis we have is that the power of flight, and then whatever unconscious decisions went along with that, in terms of priming or the experience of power, overrode whatever else might have gone on with acting heroic,” Rosenberg said. 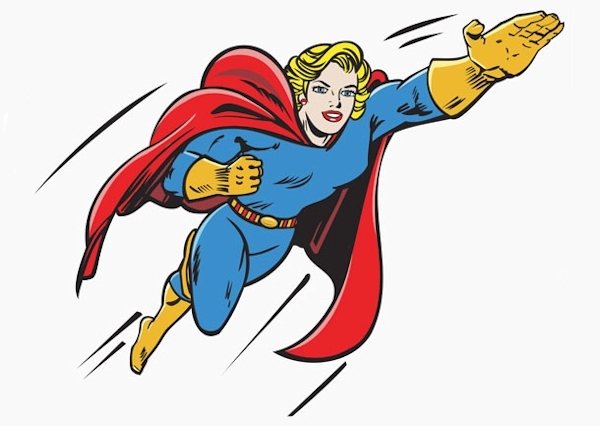 Rosenberg and colleagues theorized that the participants who were given the ability of flight were likely primed and conditioned by concepts and prototypes commonly associated with superheroes in pop culture. In fact, the findings somewhat resembled the origin stories of many a superhero. Rosenberg shared the results with Paul Levitz, former DC Comics publisher and president, and comic book editor and writer. She asked him if he had any thoughts. “Mr. Levitz noted that people familiar with superhero tropes implicitly know that after a character discovers a new-found superpower, the character’s task is to decide how to use it — for personal gain or for the greater good,” the paper explains. As it so happened, that do-good choice spilled over from the virtual realm into the real world. Researchers said the study was one of the first to examine the effects of pro-social behavior in virtual reality and the pro-social effects of embodying a superpower. Findings of the study were published in the journal PLOS One. Virtual reality’s pro-social potential, Rosenberg says, carries many interesting applications for society. Fortunately, Bailenson and his colleagues at the Virtual Human Interaction Lab are doing just that with their VR experiments. He says the collaboration with Rosenberg was a natural fit. Touting virtual reality’s ability to make the impossible possible, Bailenson says one of the big things you can do in VR is walk a mile in someone’s shoes. Bailenson cited VR experiments his lab conducted where young people were put in senior citizen avatars. He said when they left, the young people had a much better sense about what it’s like to be older, they were less ageist and more apt to save money for the future. Bailenson credits this life-altering experience to VR’s ability to offer such an extremely visceral perception. He says the last two decades of exponential growth in technology and new media — VR included — has left our brain trying to catch up, causing people to often confuse experiences in VR with experiences that actually happened. In his book Infinite Reality, co-authored with UC Santa Barbara psychology professor Jim Blascovich, Bailenson deals with this issue in the chapter called The Virtual Yin and the Yang, which addresses the contrasting moral consequences of VR being used by evil forces.